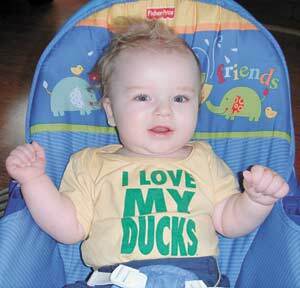 Contributed Photo Ten-month-old Evan Stauff is in Los Angeles with his family today. Doctors are performing a hemispherectomy on Evan in hopes of giving the baby a seizure-free life. The family of a North Bend baby is waiting expectantly this afternoon as 10-month-old Evan Stauff undergoes surgery that will remove a portion of his brain. The surgery at UCLA's Mattel Children's Hospital in Los Angeles is known as hemispherectomy, separating the left and right hemispheres of the brain to prevent seizures. Evan, his father David Stauff explained, has severe epilepsy and infantile spasms. It started when Evan was 3 months old, if not younger. Stauff said he wishes he'd recognized the signs in his child earlier so he could have started the process earlier. It's a message he wants other parents to know. 'It's really about time and acting quickly," Stauff said. 'If the medication isn't working, than you have to look into other options." On the morning of April 1, David and his wife, Kathleen, were roused by their infant son, who slept between them. 'We woke up to him having a grand mal seizure," Stauff said. 'That was the first one I had ever seen in front of me. So for me, I almost didn't know how to respond." Evan had four or five more, and the Stauffs took him to his pediatrician. An airplane then flew the boy and his mother to OHSU Doernbecher Children's Hospital in Portland. Since then, Evan has been on a variety of medications and a special diet, but they haven't helped. Without the hemispherectomy, the Stauffs and Evan's surgeon fear the seizures will stunt the development of his brain. His IQ could be limited 50 or 60 if drastic measures aren't taken soon. 'The probability of that in this child is about 90 percent," said UCLA surgeon Dr. Gary Mathern. 'The goal of the surgery is to stop the seizures to give the normal brain the opportunity to develop as best it can without the burden of seizures." The second risk of uncontrolled seizures, he added, is death. The surgery began today at about 7:30 a.m., as Evan's parents and two older brothers, 11-year-old Chandlor and 7-year-old Patrick, wait. The Stauffs will stay with Kathleen Stauff's aunt, Sandy Corradetti, in Sherman Oaks, Calif., while Evan recovers. As the former parent of a chronically ill child, Corradetti said her heart goes out to the family. 'We just want to get Evan through this and get them all back home with a seizure-free life," she said. The doctor said the surgery basically takes half of Evan's brain off-line, so while the left hemisphere will continue to generate seizures, it won't communicate with the rest of his body. The surgery must be attempted now before the child falls too far behind developmentally, Mathern added. Stauff said his son's development already has reached a plateau. Evan will face some limitations as the result of the radical surgery, but his quality of life will be better than if the seizures aren't halted, Stauff said. The boy has about a 75 to 80 percent chance to become seizure free following the hemispherectomy and less than 5 percent without it. After that, he'll have some mobility difficulties and some loss of vision. 'He has a positive outlook for an improved quality of life, instead of not going with surgery and continuing with the medication," Stauff said. It's been a long year for the family, Stauff said, but he's taking his and his son's experiences as an opportunity to inform others in similar situations with their children. He started a website, www.evanstauff.com, where people can track Evan's journey and learn more about epilepsy, infantile spasms and hemispherectomies. 'Don't be afraid to ask questions if your baby has a pattern of things that don't look right or your other children didn't do," Stauff said. 'I realized now that I could see those little movements. Those were hints." People who want to donate toward Evan's medical expenses can visit www.evanstauff.com or any US Bank branch and ask to make a donation to the Evan Stauff Donation Account. Reporter Jessica Musicar can be reached at 541-269-1222, ext. 240; or at jmusicar@theworldlink.com.